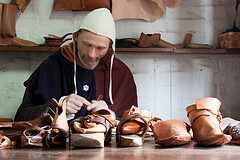 Medieval re-enactor acting as a cobbler. All novelist struggle with crafting believable characters. For historical fiction writers, I think the challenge is even greater. We walk a tight rope with believability on one side and intrigue and relatability on the other. Needless to say, it was after a great deal of research that I created Ansel Schumacher. The breadwinner in my novel, The Fairytale Keeper, Ansel is a shoemaker living in 13th century Cologne. To develop a better understanding of what his family’s economic situation would have been like, I created the chart below. There are a few things worth noting before reading the table. First, if our shoemaker didn’t sell shoes, he didn’t make money. Luckily, Cologne was a city 40,000 strong and its relic of The Three Magi drew thousands of pilgrims each year. During tough economic times, a cobbler could spend less on food and drink—foregoing expenses like spices and proteins. But there were a few expenses he couldn’t escape: rent, taxes, and tithes. Based on my research, the average shoemaker living in the middle 13th century made 44 pennies each month. Here’s what his monthly budget might have looked like. Rent 9 pennies A typical craftsman house would have had a workshop, solar, and two bedchambers. Ale 3 ½ pennies 4 cups a day per person in 4 person family. Tithes 4 ½ pennies Ten percent of a person’s income went to tithes. Taxes 4 ½ pennies Tax rates fluctuated, but on average ten percent of a person’s wages went to taxes. Household Expenses Varied based on need. A 13th century shoemaker would have bought food for his faimly at a market, like the one in this artist rendering. Hodges’ List of Prices does not list the wages of a shoemaker. I make the assumption that a shoemaker probably made the same amount as a weaver, which Hodges does list. In the year 1407, a weaver made 5 pennies per day. According to another part of Hodges’ list a thatcher living in the middle 13th century made 44% of what a thatcher living in 1407 would have made. Assuming that this rate of inflation applied to everyone’s pay, I have adjusted my imaginary shoemaker’s income and the prices of the items he buys accordingly. Hodges’ List of Prices lists the rent of a craftsman’s home in the 14th century to be 20 schillings per year in London. I’ve adjusted this according to the wages of the middle thirteenth century in which a craftsman made 44% the wages. This is a ball park figure in the most extreme sense of the phrase. First of all, this budget assumes our shoemaker lived in a city and was not able to grow a small garden of his own. Therefore, he had to buy everything at the market. Someone living on this kind of income would have relied on pottages and breads most likely. He might have had money for a little meat now and then, when meat was allowed. Nearly half the year–when one accounts for Lent, Advent, Wednesdays, Fridays and Saturdays—people living in the Middle Ages were not allowed to eat meat. Only fish was permitted during these times. Ian Mortimer says the price of fish was high, but Hodges’ list states the purchase price for 5-10 salt herrings at 1 penny. Salted herring was probably the cheapest form of fish and people grew quite sick of it, especially by the end of Lent. Also worth noting, many foods were available seasonably. In The Time Traveler’s Guide to Medieval England, Ian Mortimer states that four gallons of ale fetched a penny in the 14th century. I think it’s safe to assume that someone living in the thirteenth century could purchase it or brew it (as women were expected to do) for about half of that. Assuming that each person in a four person household drank an average of 4 cups of ale each day, the family would go through roughly a gallon a day. Surely when times were bad, cobblers drank less, relied on their wives home-brewed ale, or in dire times collected water in cisterns. They may have also spent more money on better ale or wine during times of celebration and wealth. Like today, taxes could be levied on income, goods, or property. Household expenses could be anything from household goods, clothing, grooming, and healthcare. I imagine most woman came with the goods needed to keep a peasant household. Even peasant women came with a dowry of some sort by the thirteenth century. Hodges’ List shows peasant dowries of between 15 and 57 schillings in the 14th century. Adjusted for the 13th century, this would have been 6 and 25 schillings, roughly 2 to 7 months of a cobbler’s pay. Little wonder women were praised for birthing sons. I think this also is evidence that people living in the High Middle Ages were savers and not spenders. That being said, children would come with expenses of their own. A cobbler might have to pay for them a fee for them to be able to start an apprenticeship or their clothing and shoes would get worn. Certainly during hard times, people in the Middle Ages would have kept raged shoes a little longer in order to make sure they had enough money for food. Hodges, Kenneth. “List of Prices of Medieval Items.” Hodges. List of Prices of Items in Medieval England. N.p., n.d. Web. 07 Nov. 2014. Mortimer, Ian. The Time Traveler’s Guide to Medieval England a Handbook for Visitors to the Fourteenth Century. New York: Touchstone, 2014. Print. Pirenne, Henri. Medieval Cities: Their Origins and the Revival of Trade. Princeton: Princeton UP, 1969. Print. Powicke, F. M. The Thirteenth Century: 1216-1307. Oxford: Oxford UP, 1991. Print. This entry was posted in History, Medieval History, Medieval Money, Medieval Shoemaker, The Fairytale Keeper and tagged 13th century Europe, Andrea Cefalo, Cobbler, Cordwainer, Medieval, Medieval History, Medieval Money, Medieval Shoemker, The Fairytale Keeper on November 7, 2014 by Andrea Cefalo.